The presentation of the E-Cat QX in Stockholm last week has been the topic of a great deal of discussion and scrutiny by people following the LENR story. From everything I have read, and people I have spoken with I would say that from the point of view of observers from the outside (i.e. the peanut gallery) that the event has not changed the opinion about the E-Cat a great deal, and one question that has been asked repeatedly is, what was the purpose of putting on such an event? It was not a product demonstration, since there is no product to demonstrate yet; it was not a scientific presentation, as it was run and controlled by the inventor, Andrea Rossi. To me, it seems that it was is Rossi letting people know that he has an energy production process that works, and that he was open to do business with — at the same (as usual) keeping the details of how he does what he does as secret as possible. Perhaps the most important part of the event for Rossi were the discussions that took place afterwards. Rossi explained to the attendees that he would be available to meet with people who wanted to talk with him privately in a room at the IVA conference center following the presentation. According to Alan Smith, who attended the presentation, he was still occupied in private meetings four hours after the public meeting concluded. Rossi of course won’t provide us with details of the nature of any agreement, or who he has spoken with, so it is still hard for us outsiders to gauge the significance of the Stockholm event until we find evidence of what many LENR followers are hoping for: LENR products working in the real world. 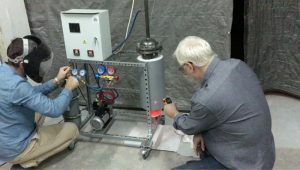 The promise of LENR and the delivery of low cost energy is not only the holy grail of physics, but a story that has the potential to change the world as we know it. Energy = high potential standard of living. The instant mankind replaced muscle power with chemical power was the instant we became freed from our limitations. The result was the rise from near slavery conditions to grow our food and provide the resources to that of a high standard of living. At least for those that have energy. Today, even high population of counties like China are able to feed their large population. In fact we even see some of those areas now exporting rice and other food stuffs. A quick glance on the grocery shelfs and was surprised at the variety of foods coming all the way from China to be sold in my native country of Canada. All this food is the result of energy. It is without question that adoption of energy is what feeds us, clothes us, and keeps us warm. Our use of energy is a significant part in near everything we consume. There are three areas that I see as booming and benefiting from LENR. First up will be the ability to grow food indoors. Even today we see an “active” market rising in indoor growing, and controlled climate production of food. In rather hot climates, such energy can control the climate, and of course provide the needed water (from sources like the ocean). So as part of this indoor growing revolution, I include the ability of LENR to provide clean drinking water from the ocean. And in cold climates, again LENR can provide the energy to grow food year round. In my local market, local grown cucumbers of excellent quality grown in greenhouses year round are about $1.60. This occurs without pesticides and even use of soil. (And sure, they are about 45 cents more than other products, but they are local grown, and their quality is beyond outstanding. Each cucumber is in perfect condition – they are grown in perfect controlled conditions. In the winter time due to increased heating costs, the same product almost doubles in price. So this area of the economy will boom with low cost energy inputs. So with low cost energy, the ability to grow food just about ANYWHERE on the planet will the result of such an energy revolution. And such food grown this way is achieved without soil, and without pesticides and without soil stress (you really don’t need soil). Who needs to plow a field to grow such food when you have greenhouses? And automation is FAR more possible with a control environment then that of traditional farming. The other revolution of course would be transportation. Transportation and movement of goods is mostly driven by chemical (fossil) fuels. LENR can transform this area. While I feel the above two areas benefit the most from LENR, the largest impact in our lives will be that of Robots. I don’t mean the factory robots, but autonomous ones – ones that can run around and deliver things, and help handicapped people at home. The “major” limitation for such robots is of course the power source. Unless some amazing battery technology breakthrough occurs, then such robots will require a power source. Imagine a “swarm” of small drone travelling into a forest. With intelligent software and vision ability (like a typical smartphone), such small drones could spend their whole day and night hunting for pine beetles, and zap them with a low power laser. Thus you can eliminate pests without pesticides. Once again, battery technology not up to the task, but a LENR power pack is. Even better is robots to help humans. Here is an excellent video that explains outlines where robots are going. We are VERY close to such robots resulting in a practical and significant contribution to society – but such a revolution cannot occur unless we find a new power source like LENR. The above is a great video – since it gives hints of how far robotics has progressed in the last few years, and what is in store for us. However without LENR, I can’t see how such machines will be powered. The following announcement comes from the Energy 2.0 Society’s website. The Energy 2.0 Society will be holding a webcast on Saturday, December 9th with Andrea Rossi as guest. This will be an opportunity for us to discuss with Dr. Rossi the recent presentation of the E-Cat QX in Stockholm and other aspects of his work. I put a question to Andrea Rossi on the Journal of Nuclear Physics about the press release that was published yesterday. There were a couple of things in there that made me suspicious, especially that in some places the release it mentioned “fusion” and “cold fusion”, which Rossi has frequently stated is an inaccurate description of his effect. There were also numerous stylistic errors, and the release did not show up on Leonardo Corporation’s ecat.com website, when the release itself stated ecat.com was the source. I did not make that release and I have not idea about who generated it. I stick on my position. Problem is that under a journalistic point of view LENR is ostic to digest, let alone Rossi effect. So it seems like this press release was probably generated by an enthusiastic supporter, who wants to bring attention to the demo. It probably won’t hurt him very much in the long run, and maybe it has already generated some new interest. I want to let readers know about something that’s going on with the E-Cat World site. On Monday morning a reader contacted me and let me know that E-Cat World could not be found on the Google search engine. I thought that was strange, because normally the site shows up right at the top of the Google list if you do a search for say, “ecat world”. But after a short time of testing, it was clear that E-Cat World had suddenly become invisible to Google. As far as I can discover, not a single ECW page currently appears in Google search results. After some more research I discovered that starting around the beginning of October there was a massive proliferation of referring pages to E-Cat World appearing on the web. According to the website https://majestic.com/ there are over 2 million of them. Doing some research I discovered that this is a typical tactic of what is known as “Reverse SEO”, which is an attack on a site where someone posts lots of backlinks all over the Internet pointing to the targeted site with the intention of hurting their search rankings. In this case the links point to E-Cat World, and from Google’s point of view it makes me look like a spammer, someone trying to boost my site in search rankings by sticking spam links to it all over the web to boost popularity in a fake way. Consequently, Google has delisted E-Cat World from their search engine. There is an appeal process which I am currently working my way through and hopefully at some future time the site will be indexed once again. What this means in practical terms for readers, is that to get to E-Cat World, you won’t be able to do a Google search to find the site; you’ll have to know the exact address of the site — www.e-catworld.com — and type it into the search bar, or use an existing link or shortcut. Or you can use a search engine other than Google to find content on the site. For example, Bing, DuckDuckGo and Yahoo search engines are all indexing ECW as normal. So that’s where things stand at the moment, hopefully the Google invisibility cloak will be lifted after taking mitigating actions, but there’s no guarantee if or when that will happen. The first task was to find a method of manageable and effective implementation of the LENR Transmutation of chemical elements. That is, a transformation of low-value chemical elements into valuable ones. A method that has a perspective of industrial application. The microbiological method of transmutation of chemical elements, was proved, by analysis results, to be unpromising. In biological environments, transmutation cannot be controlled and will not yield significant results in the next 15–20 years. Therefore, we chose to search for a controlled method of LENR Transmutation. At the end of 2016, the beginning of 2017, we gained a clear understanding of the necessary conditions that allow the Low-energy Transmutation process to occur. We have developed a number of important “know-hows” and have identified the key components that should be included in the process. During this period, we have carried out several hundreds of experiments and more than a hundred of different analyzes of the obtained chemical elements. The analysis of both the original matrix and the substance obtained after the process, was conducted. Dozens of modifications of the LENR Transmutation reactors have been built and tested. We have developed a combination of reagents and compositions of chemical elements that allowed the process of Low-energy Transmutation to occur. We have determined effective methods of energy impact on the prepared medium with a matrix of the starting chemical elements. It is necessary to point out that we did not seek to delve into theoretical concepts, but focused on practical experiments and results. As a result of the carried out LENR Transmutation, according to the developed model, valuable chemical elements of the platinum group (platinum, iridium, palladium, ruthenium, etc.) were recorded in matrices of low-value chemical elements (copper, iron, tin, etc.). Also, the presence of other elements, which did not exist in the initial matrices, was recorded. 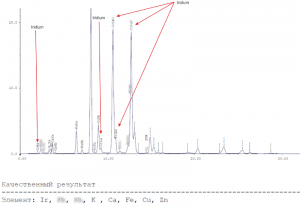 Examples of chemical analysis results, conducted in a number of independent laboratories. Image 1. Spectrogram showing presence of a valuable element (in this case iridium), which was not present in the starting material. Image 2. Results from another laboratory using other analytical equipment. 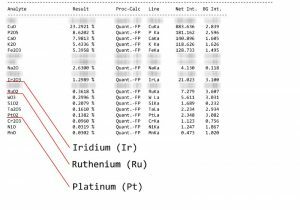 As a result of LENR Transmutation iridium, platinum, and ruthenium were obtained. Analyzes were conducted in various laboratories and using various equipment in order to receive versatile data. The results confirmed the occurrence of new elements, among which are chemical elements of the platinum group. Concerning the Cold Transmutation, the Coulomb barrier and the things alike, I can explain them in the following way. I just want to share it with you. Imagine that the outer border of an atom is like the walls of a house you live in. People inside the house are like protons. If people try to leave the house chaotically, they will bang against the walls. And in order to get out of the house you have to destroy the walls. That is, to overcome the Coulomb barrier. But in reality, people do not leave their houses breaking down the walls. They go through the door or, in the extreme case, through the window. This door or a window is the way, the tunnel through which the proton exchange takes place. And this is Cold transmutation (LENR Transmutation). Summing up, the research group “Synthestech” has carried out a successful experimental and research work. The foundation was laid for the further development of the technology for LENR Transmutation of chemical elements. There is a realistic perspective in the foreseeable future, with the appropriate technical and laboratory facilities, to develop an industrial technology for the LENR Transmutation of chemical elements.